Well it is finally here! Bird season has begun and we spent the last few months getting ready to welcome back our valued repeat customers and we are eager to show our new customers a great experience hunting waterfowl in central Alberta. Aaron has been busy making connections with the incredible landowners who graciously grant us permission to hunt the many pea and barley fields and potholes in our WMUs so we can lock down epic shoots. The kilometers are starting to accumulate on the truck as we hit the road to scout between long paperwork sessions, inventory, trailer organization/maintenance and calling practice. We retired a few of our favourite decoys but we weren’t sad for long as we unwrapped our amazingly life-like decoys from Tanglefree and kitted out the new VNO pup with his vest and blind. We packed away our new camouflage from Sitka into our totes so on days off we can take to the stands for archery season. In addition to our reduced rate for bird processing there are a number of changes occurring this season. We are pleased to welcome a new cook to the team. The guides/scouts are already joking that they won’t be losing any weight this season. Also, the new lodge will make for the ultimate Alberta hunting experience. Lastly, we are launching our ‘Fins and Feathers’ packages; a few of our clients will cruise the North Saskatchewan (for sturgeon, jackfish and walleye) and nearby lakes. This season, Aaron is passing on bird retrieval duty to Gauge. Our 11 month old black Labrador Retriever is home after almost 5 months of training at Trailrunners. He was able to obtain his Junior Hunt Certification in Saskatoon. We have been working with Gauge everyday on retrieving and obedience so he will be solid this upcoming season. Since he is still young you may only see him on duck hunts. 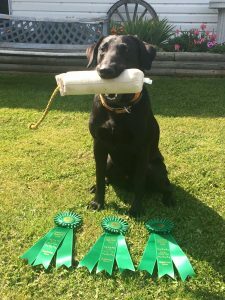 Trailrunners offered a gundog training weekend in June which Aaron attended and got his first chance to work with Gauge. On the first day after the reunion; there was leadership and obedience training. Day two was very busy as they worked on fetching on command, inside and outside drills, loading and unloading and yard work at the corral. Later on in the afternoon Aaron and Gauge worked on water steadiness, bird blind work and of course gun safety. On the last day they spent more time in the field “hunting” with the dogs and sadly Aaron had to say goodbye to Gauge so he could continue training for another month. Gauge’s transformation has been remarkable. He left us in March an anxious little puppy and came home a confident dog eager to get into the field; desperate to work. We cannot thank the staff and the Oudshoorn family enough for the time and care they took with Gauge. We cannot wait to head out with our clients each and every morning with Black Rifle Coffee in our mugs and excitement coursing through our veins. 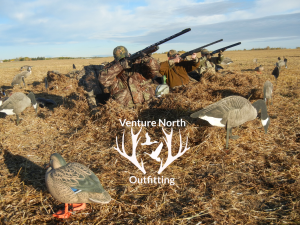 From the staff at Venture North Outfitting we wish everyone a fruitful and safe hunting season.